FiveFingers runners typically land on the ball of the foot towards the lateral side. It’s probably good to land with the foot nearly horizontal, so you don’t work your calves too much. After the front of your foot lands, let the heel down gradually, bringing the foot and lower leg to a gentle landing. (It’s like when you land from a jump, flexing the hip, knee and ankle.) Again, the landing should feel soft, springy, and comfortable. In this video you will notice a Force Curve showing the amount of force transferred to the human skeletal system when the foot impacts the ground. 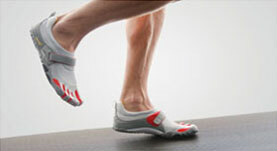 With a traditional heel striking form, the force curve shows a significant impact transient force when the heel lands. This transient force is an unnecessary force that we inflict on the body by utilizing a heel striking form. Over time this impact transient force becomes magnified and it has been believed to contribute to injury.